From This Point. Forward. : Our Wedding!!! After more than eight years together, APL and I got married on May 28, 2011 - the same day as his parents' 34th wedding anniversary - on his parents cherry farm in Groveland, California. On our wedding day, APL and I got ready in separate houses and saw each other for the first time on the back 40 acres of his parents farm, where APL gave me a gorgeous turquoise necklace as my wedding present. We took some pictures and then met up with the rest of the wedding party to start the ceremony. APL and his boys met my dad down by the creek, while my girls, both moms, and my three adorable flower girls and I loaded into a horse-drawn wagon. 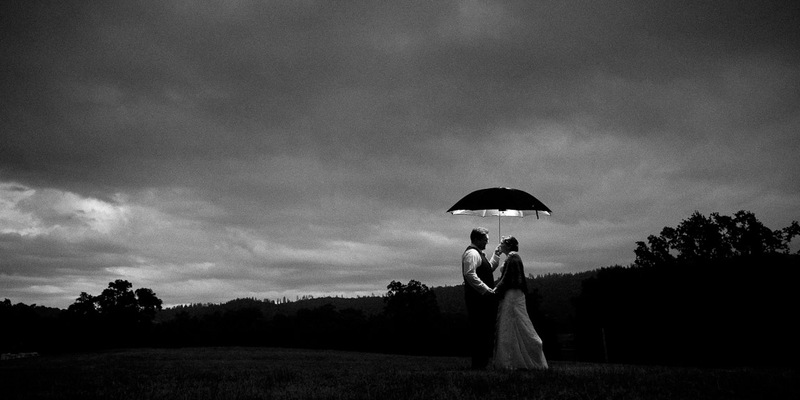 Right before the ceremony was about to start, the sky opened up and a light rain started to fall. It was also way colder than it usually is in May - so I was a little nervous about our guests being freezing, wet, and miserable. But everyone was in amazing spirits - digging jackets and umbrellas out of their cars or standing under the oak trees to stay dry. And my worries disappeared as soon as our River walked down the aisle - or should I say dragged my little cousin down the aisle!! She then proceeded to whine and fret - loudly - at being kept away from her parents throughout the whole ceremony. Everyone was laughing. APL's aunt performed the official ceremony, and my great uncle (who is also my godfather) performed a Polish hand-binding ceremony. Then we were married!! Because of the rain we had to move all the dinner tables we had set up in the meadow down to the barn - amazingly they all fit as perfectly as if it had been planned that way. Everybody helped move the party to the barn - guests carried tables, chairs, bottles of champagne, vases of flowers - I even saw my littlest flower girl helping her mom dry the chairs from the rain. So, rather than ruining the day, the rain created such a wonderful feeling of love and family and friendship at our wedding - and the rainbow we got to see right before dinner didn't hurt either! To be honest, the rest of the evening is a total blur of toasts, hugs, well wishes, dancing, eating, drinking, and general craziness. I think everybody had a good time - we certainly did! I'm sure those of you reading this blog are also interested in how I got through my wedding day with my RA. To be sure, that was something I worried about quite a bit before the wedding. But, when the day really came, it just didn't seem to cross my mind. I don't know if I got a lucky day or if it was adrenaline or what, but I felt pretty amazing almost all day. I will admit that at one point, quite a bit later in the evening, my knees started to hurt quite a bit - but one of my college friends helped me find my purse and I took a vicodin, slapped some solanpas around my kneecaps, and went back to dancing without ever thinking about it again. I think it also helped that took advantage of every offer of help that I was given that day - without feeling bad about it at all. If someone offered me a chair to sit in or to get me a drink of water or to carry something for me I let them - and I've never had so many people so willing to assist me in my life! I was also really surprised when the good feeling or adrenaline (or whatever it was) lasted through the entire day after the wedding as well. Since it was a holiday weekend, a lot of our guests stayed in the area on Sunday, and APL and I spent the day hanging out with our friends from all over the country in the house we had rented on the lake. We talked, laughed, played games, and finished off the kegs and food left over from the wedding. APL and I even canoed all the way across the lake to the house where my dad and his family were staying - and still I wasn't in any unusual pain! We had a wonderful wedding, and I am so very lucky to now be married to such a wonderful man!! Your photos are gorgeous. The one of you & your husband in the field with the blue sky above you, holy crap, just beautiful. MELISSA: Thank you! We are SUPER excited to see the rest of the pictures from our awesome photographer. Congrats Mariah! Couldn't see your wedding pictures but I'm sure that you looked gorgeous...you have such a beautiful smile in all of your pictures. The post about things you love about your husband made me cry ... so happy that you have someone so special in your life. And/or I just added a link in the wedding post to my FB album, with pictures taken by friends and family. Obviously not as professional but some of them are equally good!